January Journal: Day 15 — Ginger writes. Today will be the first in a series of blog posts on memory work. It is something very close to my heart, and lately, I can't stop thinking about ways to encourage others in this pursuit. In hopes of not overwhelming anyone with too much information at once, I plan to break up my thoughts into several shorter posts. Today is just a day for dipping your toes in the water. That is how it starts. The beginning is simply to decide, for one reason or another, that you (and your children, if you have them) want to memorize something. It can be a poem, a speech, or a portion of Scripture. 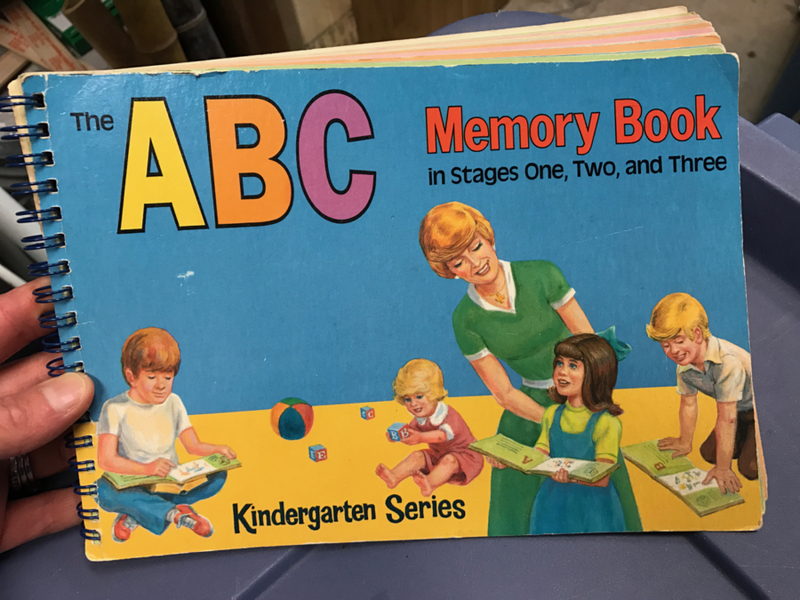 Memory work for me began at a young age with learning a Bible verse for each letter of the alphabet from The ABC Memory Book that our family had. I also learned the Books of the Bible in order, which I've never forgotten. I don't know why my parents thought it was important for us to memorize Scripture, but it is one of the things I am most grateful for about my childhood. At one point, my parents promised to give us $20 if we could learn 100 verses on our own. I kept a maroon index card box full of cards of the different verses that I was memorizing to add up to my 100. I distinctly remember picking out Psalm 136 to learn because each of the 26 verses is a short phrase followed by the same words, His love enduresforever, over and over. At 26 verses, that psalm was evidently worth $5 to me, and money well spent by my parents. For wouldn't we all want our children to know by heart, 26 times in a row, that God's love endures forever? I do not recall memorizing anything for school, other than content from textbooks for test recall. There was no poetry, no speeches, no Scripture as a part of our school curriculum. I realize now what a missed opportunity of so many years. But again, my parents somehow knew it was important, at least for the Scripture piece, so on we went learning a verse here and a verse there at home. I also remember learning Bible verses at camp each summer. We would have a rest hour each day after lunch, during which time we could work on learning a list of verses we were given at the start of the week, and then we could recite them to our counselors toward the end of the rest period each day. Whether or not I looked forward each summer to the actual work of learning the verses, I know I looked forward to receiving my "Completed Memory Work" certificate during the Friday night banquet and awards ceremony. It wasn't until I had my own children, though, that the heart of Scripture memory came back to me. I don't know why, maybe just as my parents didn't know why at the time they taught me, but I felt it was important to start teaching Bauer bits of Scripture when he was around four years old. If memory serves me right, we began with Psalm 23 (see video below). And then Bauer attended Awana for a few months, during which time he was tasked with learning very condensed versions of certain Bible verses. Although we didn't stick with the Awana program, it was helpful in that it informed my decision to focus on learning longer portions of consecutive verses as opposed to the tiny bits of a verse here and a verse there that Bauer had to memorize for Awana. Please don't mishear me in this. Any tiny bit of Scripture will help, just as any bit of fruit or veggies in one's diet is a step in the right direction. But it was the larger doses of Scripture, the verse after verse of some particular passage, that really began to make a difference in how Bauer's mindset was being formed and his long-term memory impacted. It was still very much "toes in the water" at that point, though. The desire was there, but no real plan, no real experience, no tried-and-true formula. I knew very little of what I know now about how to do memory work with children in a way that is unforgettable and impactful (and which I will share in the coming days). I just knew enough to know it was important to me and thereby wanted to make it a foundational practice in our family.